Russian manufacturing firm Kalashnikov has wheeled out a retro-looking electric car it says will give Elon Musk’s Tesla a run for its money. The firm behind the famous AK-47 assault rifle presented the eggshell-blue prototype vehicle, the CV-1, at an event near the capital, Moscow. It said the CV-1, inspired by a Soviet hatchback created in the 1970s, was a revolutionary cutting-edge «supercar». Kalashnikov was earlier ridiculed over its new combat robot «little Igor». The company said in a statement on Thursday that the CV-1 car featured a number of «complex systems» with technology that would «let us stand in the ranks of global electric car producers such as Tesla». It added that, when fully developed, the car would have a top speed several times higher than current electric vehicles produced by its firm and would be able to travel 220 miles (350 km) on a single charge. As it is an initial prototype, details such as the vehicle’s price tag have not yet been disclosed. Kalashnikov has been looking to take its brand in different directions and recently launched a clothing line and a catalogue of personal items ranging from umbrellas to smartphone covers. However its decision to go down the road of developing electric vehicles was met with mixed reactions in Moscow. Social media users quickly took to the company’s Facebook page to share their thoughts on Russia’s answer to Tesla, with some commenting on its «funny Zombie-like» design, while others praised its «cool» appearance. «Your tanks are great, but it would be better if you stayed away from cars,» one user wrote. 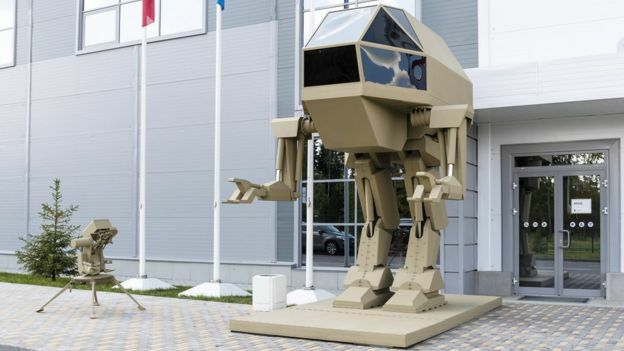 Earlier this week, Kalashnikov unveiled Igorek (aka «little Igor»); a four-metre (13 ft) tall, 4.5-tonne, manned robot designed for «carrying out engineering and combat tasks». At a time when robots are competing to become smaller, sleeker and smarter, the company was mocked over the robot’s bulky old-fashioned design. Kalashnikov later said it hoped to display an improved version of the robot at an exhibition in 2020. Manafort trial: Who is the woman in the blue dress? Be the first to comment on "Kalashnikov’s CV-1 electric car touted as Russia’s answer to Tesla"